When ordering your custom design, please provide as much information as possible about the type of design you're after. If you would like a photo included, please let me know when you place your order. If I have any queries or require clarification on anything, I will contact you before I begin your design. The custom design fee includes the design, including 3 revisions. More than 3 revisions may incur an additional fee. You will receive a "proof" of your design by email within 5 working days of receipt your complete brief and your payment, for your approval. If I need to email you for clarification or further information, the proof may take longer to create. The price is for the design only. I will discuss and invoice you separately for the printed products at the end of the design process. 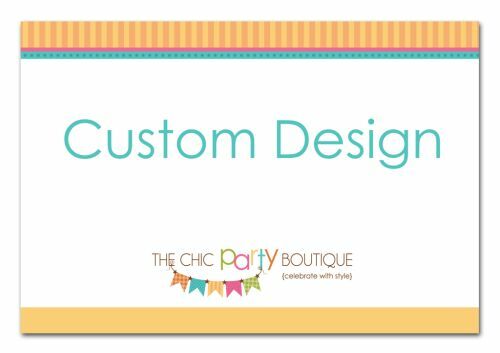 Every stunning invitation from Chic Party Boutique is printed on quality cardstock for a top quality finish. All of our invitations are fully personalised and will arrive complete with all details printed on them. All that's left to do is add your guest's names to the invitation (if you wish) and send them. Add this custom design product to your cart. At checkout, please select "Exempt - Digital Files ONLY" as your shipping option so the shipping is not added to your cart. You will be charged shipping when ordering your printed invitations. Party Extras: For a party with even more sparkle and flair, Chic Party Boutique have co-ordinated party boxes, wrappers, toppers and thank you cards to match every invitation design. Select the Party Extras you need at the bottom of your order form. The quantity of extras will automatically be the same as the number of invitations ordered. Alternatively, you can purchase party extras at different quantities by clicking the Party Extras option to the left hand side of this page.